We hope that you enjoy your visit to our website, and that you find any information you are looking for. The school is also on TWITTER please feel free to follow us @Northcotesch to get a snap shot of life in Northcote on a daily basis. 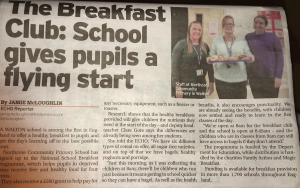 As featured in The Liverpool Echo, we proudly work in partnership with ‘Magic Breakfast’-Providing a free bagel breakfast for all children who arrive to school on time each day, either at the entrance door (years 3, 4, 5 and 6) or in their classrooms (years 1 and 2). Food is also provided for reception and nursery children from ‘Magic Breakfast’.